Comme d’habiture, j’ai oublié de faire un post pour créditer le travail de ceux qui m’ont tant offert pour permettre à Obenkyo d’exister ? Tout ça grâce à la licence Creative Commons ! – KanjiVG – dessin de tous les kanji (base volontairement limité aux JLPT 1-5 et niveaux scolaires 1-8. Les informations ont parfois étés modifiés pour faciliter l’algorithme de dessin : ajout de tags, de dessins alternatifs …) – si vous voulez que j’ajoute d’autres kanji, laissez un message ou envoyez moi un mail. Merci encore à toutes les personnes qui ont participé à ces projets, et je vous encourrage à participer à ces projets par n’importe quel moyen.As always, I forget to update the credits to thoses that allows Obenkyo to exist because of the Creative Commons licence. Once again, I want to thank everyone that are working on theses projects and to encourage everyone to help them in any means possible. Concerning Kanji it would be pretty hard to add one, but send me the list of kanji you want to see added and I can add them for the next update. What do you think about passing obenkyo on an open source licence? You are not the first one to ask for it, and I must admit, that the main reason why Obenkyo is not open sourced, is the little shame concerning the quality of the code. Obenkyo is my first Android/Java/OO project (I work as an ABAP developer that is more akin to script languages than OO ones), and right now the code is a mess. I have a project for a long time now that I have to work back on, to open source the most important part of the code : the KanjiDraw View that I have created almost from scratch, and the recognition algorithm. I believe that it is the most « interresting » part of the code, and the one where external input could really transform the usability of the app (and the users input with the « report error » give me a goldmine of usage test to test the changes !). But it is something I would love to do, even only to repay KanjiVG team of the great work they have done ! I have a collection of sound files for japanese words. I’m not pretty sure about its origin and it’s license, so I’m not sure that it is acceptable to distribute it with Obenkyo, but it would be perfect if there would be feature allowing playing such files during test. I think in will help remembering of reading. Is it possible to implement such thing in any way? Is one more source on audio files. 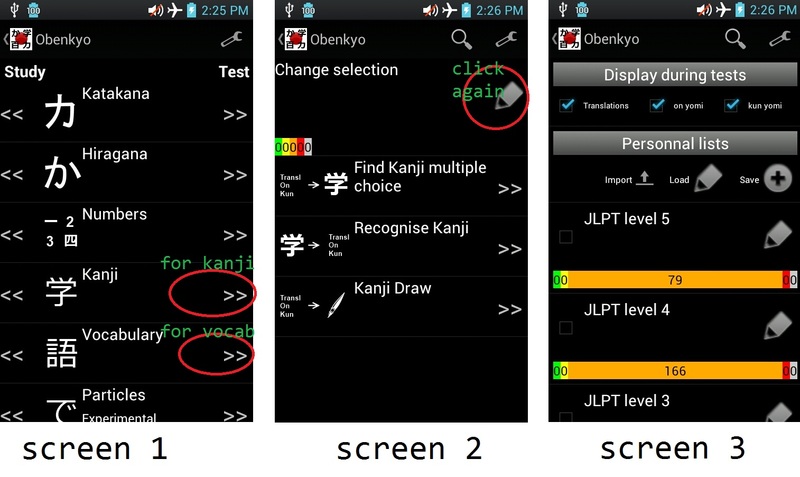 ability to show reading on dictionary kanji words. Do you make it automatically or by hand for each work? If first, it could be intersting as separate application or section for reading training. Unfortunately, no, I had to add them by hand (with the help of the Tatoeba project that populated it actually). http://jgloss.sourceforge.net/ has such feature using dictionary. But I don’t know whether it be possible to port this feature to obenkyo. Hello! Can you add translate in russian? Or can I help you to do this? what do you want to translate ? If you want to translate the Tae Kim’s Guide, go on his web site ( http://www.guidetojapanese.org/forum/ ), if you want to help for vocabulary & kanji, right now the code does not allow to add other languages (it will change, but really don’t have time recently to work on the app ^^;; ). thanks for all the effort you are putting in this project firstly. And then I would like to ask you if you are going to improve the custom lists side of your app. It would be great to be able to add words from the quizzes directly to a list. Concerning the abilty to add words to a custom list, I do like the idea but right now it is not my priority. First I would like to thank you for creating such a wonderful app! I am using the remembering the kanji classification of the kanjis, since I’m learning them using the Heisig method. The thing is that in the application you use the old classification instead of the new one that came up around 2010 (I’m using the new edition of Heisig’s book). What do you think? is it possible to update the classification? if it’s too much work for you I can offer updating it myself(I’m also an android programmer). Hello, after not wanting to bother you for months, I’ll ask. How do you determine the order of the Kanji shown? Is it from a standard list somewhere? [Is there a way to make a back up of the ordered lists by levels or school grades in case I do some weird thing and rearrange the characters by accident?] I am loving the order of the Kanji – I want to be able to print a list – of the Kanji and the vocabulary – the « write each word 5 times » thing on top of the quizzes. I hope that was clear – I have a hard time putting what I want into words orz. So, I group by JLPT (or other group you set in settings), and sort with this value (well, I give numbers a little boost so that they always appear first ). I am not sure I understand what you mean by « Is there a way to make a back up of the ordered lists by levels or school grades in case I do some weird thing and rearrange the characters by accident? ». One way to get the ordered list I use would be to export personnal lists chapter by chapter and mix them in Excel. For the vocabulary order I think I find in the word the kanji with the smallest rank and attach the rank to the word. This way I get the words with more frequent kanji first. It’s not a bulletproof method, but I like the result. Arranging by frequency of usage and boosting the numbers – that is actually very clever :D. The obenkyo order seemed more logical. I didn’t know we could export lists! I don’t see that option on my LG L7 but when I got the app on my brother’s Samsung tablet, it’s present. I tried to save the list and export and it says it’s saving it on the « SD card » (i have a micro sd inside), but I can’t find it when I connected the tab to my pc and tried to look for the .txt files in the microSD card. Will try a few more things. edit: I found the import/export functions in my LG L7. I still can’t find the exported lists in my sd card or onboard memory. like, no .txt files, it’s not in the obenkyo folder either. I’ll try a few more things. 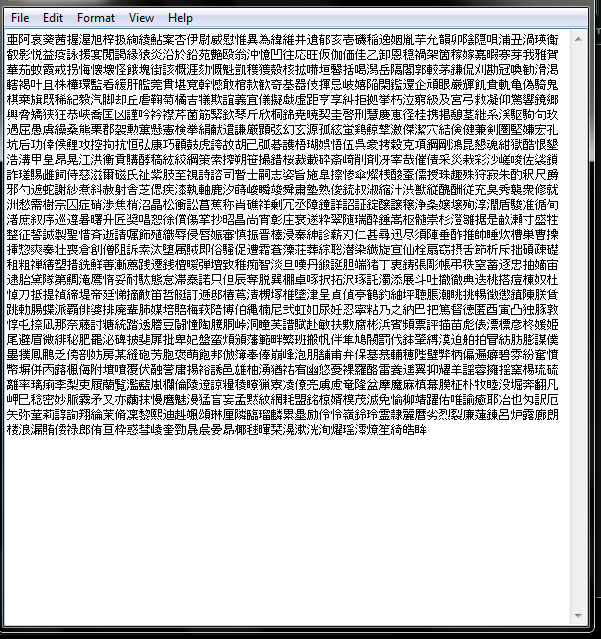 I looked around using the polaris file reader and found the files. They mysteriously don’t appear on my PC when I search the Obenkyo_data folder. I just emailed myself the 12 files from my phone to PC and I can open them now :D. very primitive though. I think it’s something wrong on my side.